The Transfer Triumph program aims to help improve the academic success of first year transfer students at the University of California, Irvine. Housed under UCI’s Transfer Student Hub, this program was formed to aid transfer students on academic probation by connecting them with campus resources, reinforcing their strengths, and providing them the tools to be academically successful. Transfer Triumph at the University of California, Irvine strives to provide support to students who may be struggling and or on academic probation. Through its 5 week workshop series, Transfer Triumph aims to enhance the academic success and student engagement of first year transfers at UCI. Students in this program are given an opportunity to assess their strengths, reflect on their values, and learn how to be a successful student at UCI. As a Transfer Triumph student, we understand that there are varying needs that can affect the academic success of a student while balancing the new demands of a four year university. 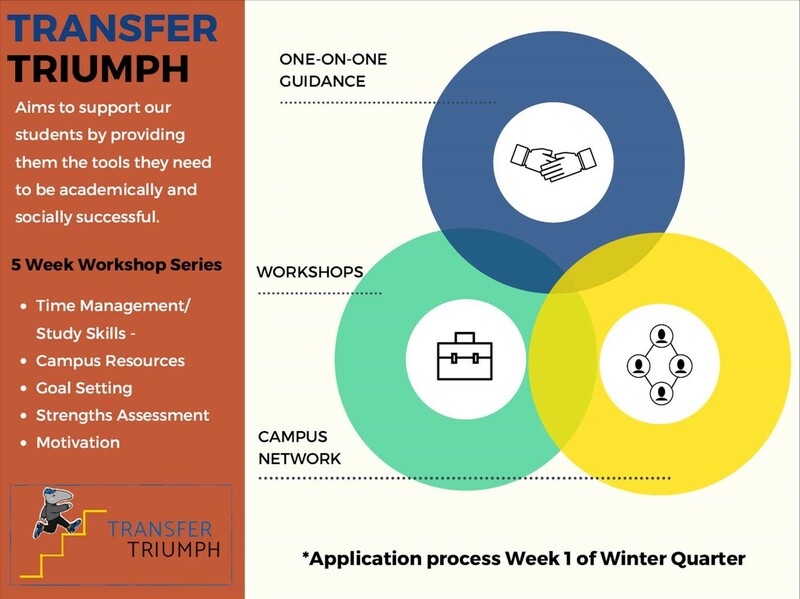 Therefore, Transfer Triumph program participants are assigned a transfer counselor that supports their academic success and successful transition into the university.